If one good deed in all my life I did, I do repent it from my very soul. Gladiator. I can't say I agree with that statement entirely, I didn't think Gladiator was that bad, but surly these two movies are on different planes. Titus is a movie for the cultural elite. It is a great movie if you are able to get through the popularity filter, and one I can say I highly enjoyed. Two things will push about 99% of the audience away from this film. First, and the most difficult, is the dialect. This is Shakespeare, and is spoken as such. This isn't some new age rendition of Romeo and Juliet, it embraces the language as do the actors, and if they would have faltered at all it wouldn't have worked. The second thing that killed any chance of this movie going main stream is the use of modern day props in a movie set two thousand years ago. Vengeance is not articulated with a flaming sword but with a German Mauser. The sons of the current emperor use '65 T-birds as chariots. There are some wonderful shots in Titus, ones that push this movie into the realm of a great film. The introduction, following the march of the army of Rome into the arena, seems very odd at first but grows into the sinister march of death. Another vision of true horror takes place later with the mutilation of the fairest creature of the movie. The final sequence builds into a crescendo of violence, drama and horror all at once. A true Shakespeare ending if I have ever seen one. The DVD of Titus is a collectors edition containing a 16x9 enhanced picture and Dolby Digital 5.1 sound. It is a two disc set including multiple commentary tracks, making-of features, and a Q&A with the director, Julie Taymor. Definitely one of the better DVD releases. Titus isn't a movie for everyone but if you fit into the 1% of people who can get by the odd grammar and can accept the unique blending of modern props and sets, you should have a great time. 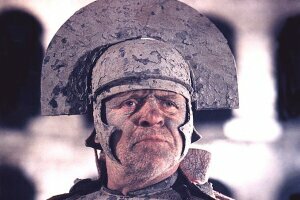 Titus and Gladiator actually go hand in hand as tales of Rome. One for the snobs and one for the masses.